At Genesis Watchmaking we specialise in servicing the El Primero automatic chronograph calendar watch. The El Primero 36000 vph movement is a tour-de-force of watchmaking design and was used for many years by Rolex in their early Daytona chronographs. It is a movement that we are very familiar with and can offer the highest level of care and attention to detail. We will only ever fit genuine factory parts as we work closely with the Zenith materials department. Our service is fully backed up by our two year warranty. We fast-track these watches and will call them in as soon as they are booked in. We will consider other Zenith models for service but with some older models parts are no longer available and we will have to decline the work. It should be kept in mind that the Zenith materials department in the UK do not carry all the casing and movement parts for the entire Zenith range currently in production. 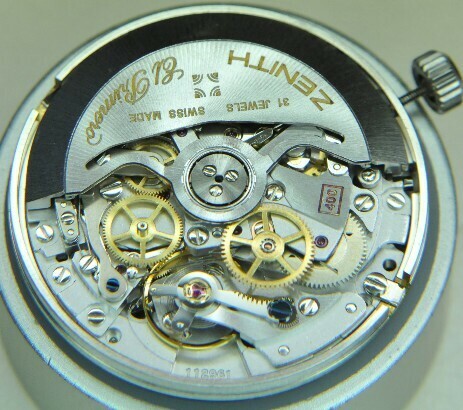 In such cases there can be a four to six week lead time while Zenith in the UK obtain the parts from the Swiss head-office. We will of course keep you informed if such a delay occurs with your repair. If you wish to book in your Zenith watch, obtain a quotation or see our price list please click on the images on the right. 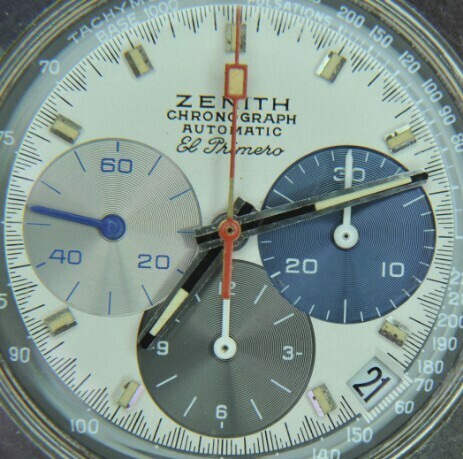 The slides below show aspects of servicing a Rainbow Flyback version of the El Primero.